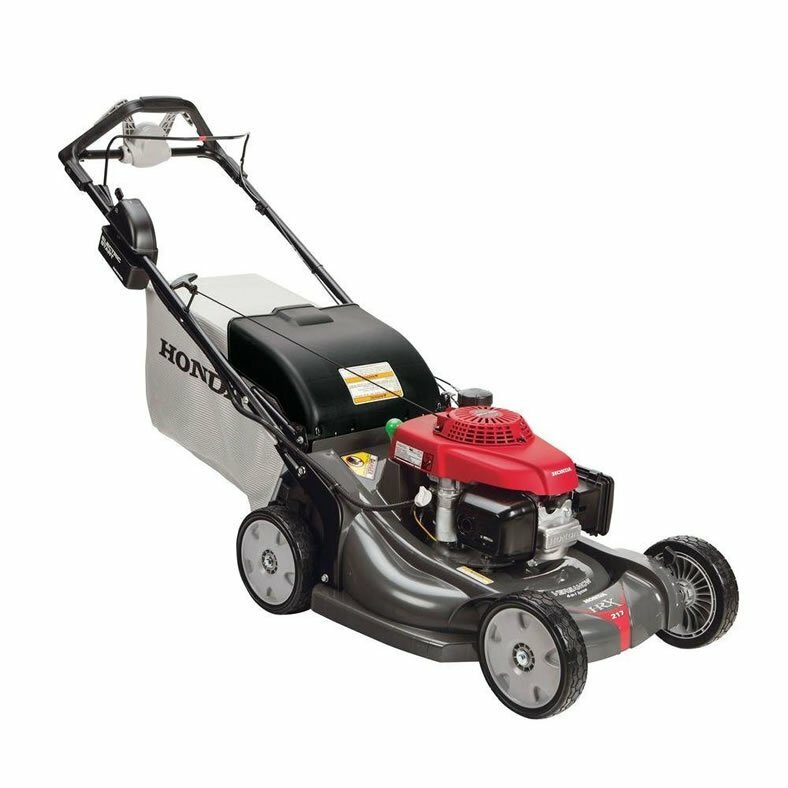 A quick look at the Honda HRX217VLA walk-behind lawn mower is enough to know that it’s just a classic-looking lawn mower that is idea for diligent homeowners who own medium- to large-sized yards. The fancily named NeXite Deck is 21 inches and boasts MicroCut Twin Blades that are designed to really mulch grass up and allow for more shredded clippings per bag. And how cool is the 4-in-1 Versamow System™ that lets mowers choose from mulching, bagging, discharging, or shredding those plentiful leaves come fall? You can even do a combo mow of both mulching and bagging. 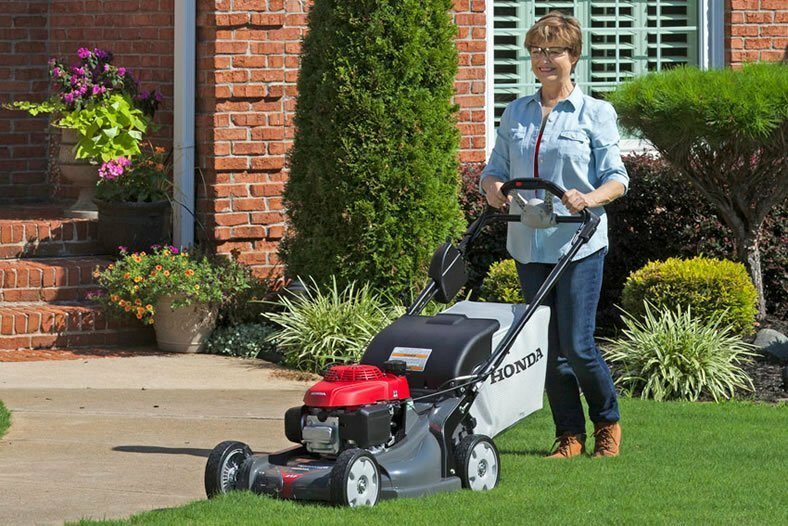 The self-propelled machine runs on the Honda Select Drive option, which allows you to adjust the mower’s speed to the pace you’re walking with the simple rotation of a speed-adjust dial. You can go up to 4 miles per hour. 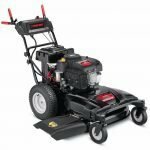 That power originates from a highly reliable Honda GCV190 engine that is easy to start, good on gas, and meets the EPA and CARB certifications in all 50 states. This nice-looking mower conveniently starts up electrically with the help of a self-charging battery. There’s lots to like here, so read below for more info. More than likely folks are gonna love how this mower performs, as it provides a smooth and even cut thanks to its MicroCut-designed blade. 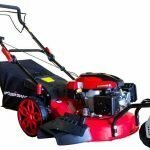 This blade has four cutting surfaces, not a mere two like on some mowers, so it truly slices up any type of grass very finely. The end result is a cleaner-looking yard, less clumps, and minimal cleanup when you’re done. The mower’s rear discharge option lets you maneuver in and around obstacles much easier because you don’t have a side chute to deal with. Also, the 9-inch ball-bearing wheels enhance maneuverability and make you feel like you’re walking behind a smooth-running machine that is very stable. It does great around shrubs and other debris, tackles tough patches like a champ, and the HRX217VLA will pull you up slopes just fine with its abundance of power. The HRX217VLA cuts a standard path of 21 inches, but what’s great is that the 9-inch wheels don’t make too deep of an imprint on your yard. This isn’t a quiet mower by any means, but the machine’s many conveniences and quality features will be appreciated. Stick in some earplugs and you should be fine. 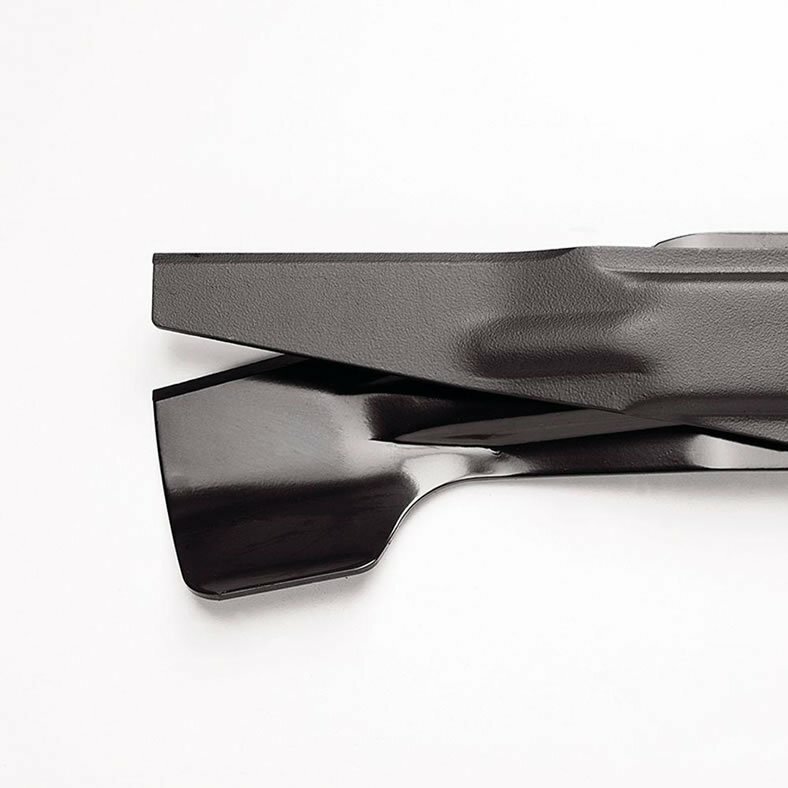 The handle is angled and has a thin foam for less vibration and hand fatigue. It’s a smooth-running mower anyway, so vibration shouldn’t be an issue. The non-metal deck means that debris and grass-buildup is not as common on the underside, keeping the mower cleaner and easier to clean. Lastly, this machine’s Versamow System also shreds leaves like nobody’s business, without needing any extra tools or attachments. The HRX217VLA is easy to start whether you use the electric or pull option. It’s also simple to assemble, and you should be able to get started in no time after reading through the instructions and filling it up with oil and gas. I like mowers that are made for the masses, and this one certainly qualifies. It’s self-propelled so the young, the old, and those with arthritic conditions should find it easy to walk behind. 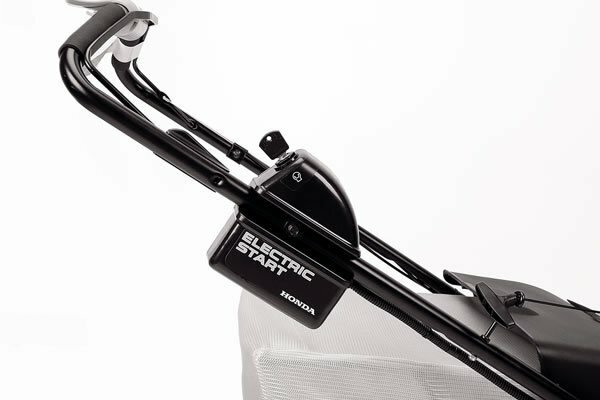 And its variable-drive system is unique in that you control speeds with your thumb in the middle of the handlebar rather than a bar. What’s more, the thumb controls can be adjusted to different angles for any hand size and pushing style. This type of control takes a bit of getting used to, no doubt. The mower may seem fast at times, but you can slow it down if needed. At 41 inches, the handle is perfect for those over 6 foot, but it can also be adjusted to three different positions to suit anyone’s height. It has a quick-release connection at its base, so you can easily fold it down for storage or moving purposes. The larger gas cap and opening is also an understated feature that prevents nasty spillings and fumes. Not all mowers have the option to start electrically or with a pull cord, but this one does. Those with a bum wrist will love that electric-start option, but you can also do it the old-fashioned way by pulling the cord. Heck, you could even mix it up with family members if the wife and son want to use the electric starter and you can rear back and pull the cord if you’re so inclined. You can select from seven cutting heights using the HRX217VLA, from three-fourths of an inch to 4 inches. That’s a pretty good range in my book. The downside is that you have to adjust each wheel, which to me is a real pain. 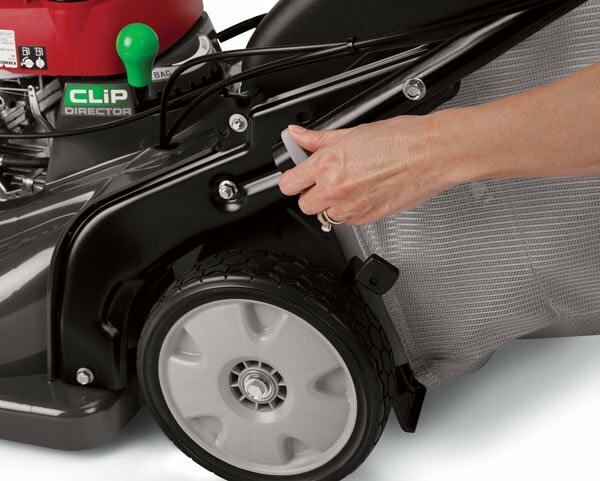 The clipping collector is large and can hold lots of highly mulched grass, which means you won’t have to waste your time changing it out too often if you choose to bag. In fact, you can mow 40 percent farther with the HRX217VLA bag. The bad part is that when this bag collector becomes filled to capacity, it’s definitely on the heavy side and might be a burden for some people. But it is perfectly angled on the mower and won’t make stop the blade if it gets overly full, which can sometimes happen on other mowers. 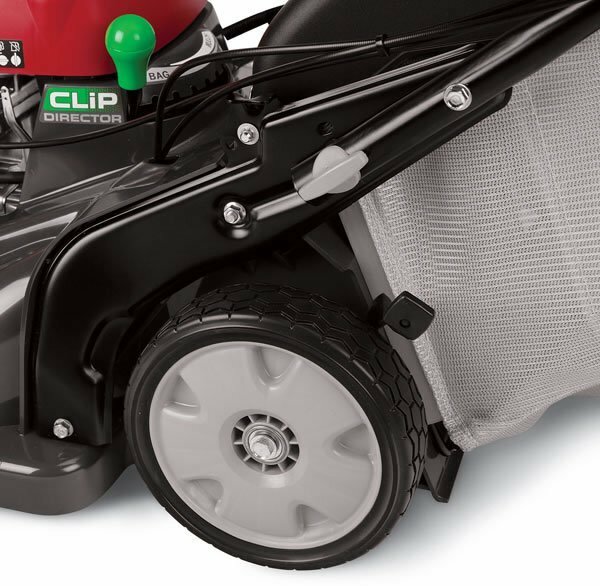 With the mower’s Versamow System, you can adjust the clip director so that some of the grass gets mulched, and some of it gets bagged. This is a great setting option depending on certain mowing conditions such as when the grass is slightly wet and you don’t want to leave clumps, but you also want to mulch. 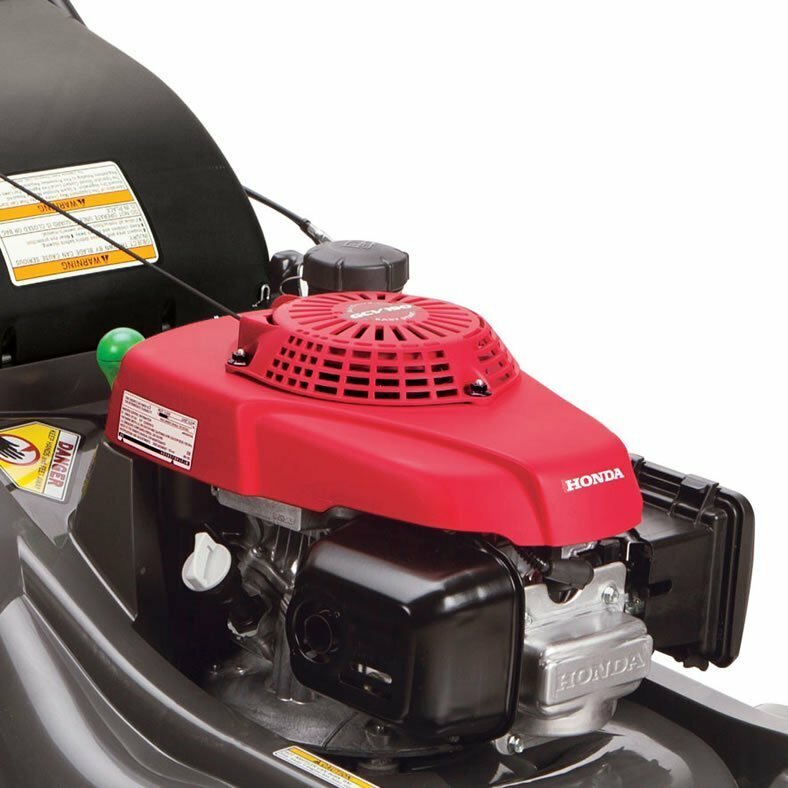 Check out your mower when your first purchase it and read the owner’s manual thoroughly. You’ll need to assemble the grass bag if you want to bag, add engine oil, and adjust the handlebar. The longer you use the mower, the more wear and tear you’ll notice, such as with the rear shield, which will eventually need to be replaced. Beyond that, check the schedule for maintenance on items such as the blade, fuse, air filter, oil, spark plug, flywheel brake pad, smart-drive cable, and the pinion gears. Failure to follow the maintenance schedule could result in non-warrantable issues. 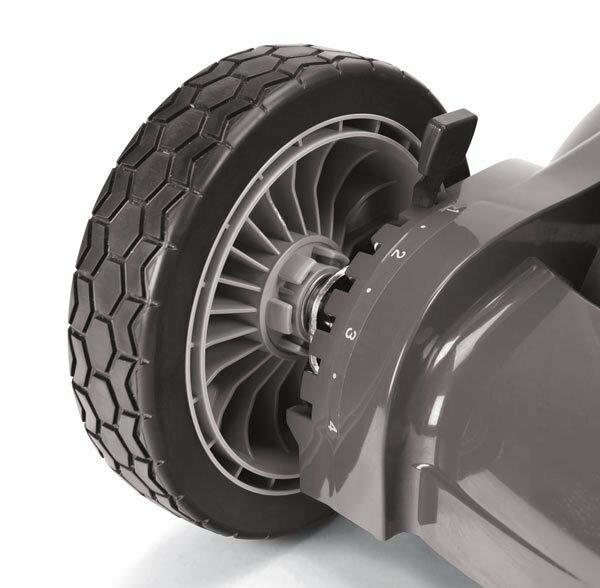 The flywheel brake safety system that quickly stops the engines and blades when the operator releases the handle. Additionally, the fuel valve shuts off if you need to move, store, or perform maintenance on the mower. The mower comes with a key for the electric start, so be sure not to lose it. I’ve listed off several great features of the HRX217VLA, but I haven’t mentioned its molded sort of skirting around the cutting deck, which prevents grass from spraying out of the sides. It’s just one more clean feature to this machine that’s nice. Although this skirting makes the mower seem a tad wider than it really is, don’t be fooled. 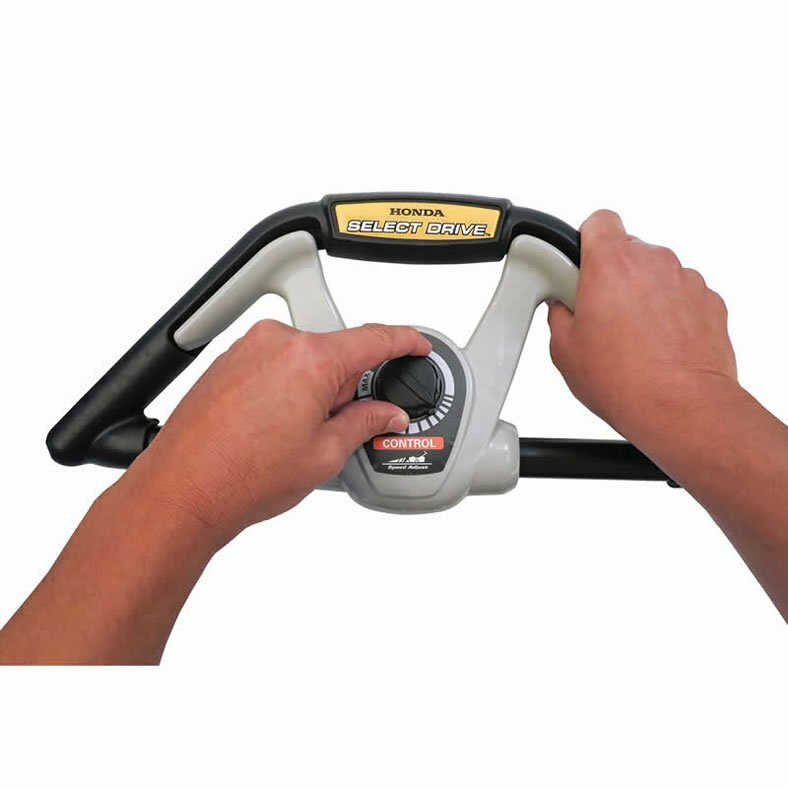 It’s a maneuverable machine that can get close to edges and do a good job. Also, the rust-proof deck is ideal for those who live in areas near the ocean where rusting is more common. Honda is known as a top-of-the-line company, and one of the ways you can see that is in its generous limited five-year warranty to cover faulty design and parts. Research it and you’ll see: This is an above-average warranty length for many other types of mowers in this price range. This is truly an every-person mower in terms of being self-propelled, 4-in-1 mowing options, and the choice to start it in two different ways. You get some good things considering what you pay for it. Beyond cost, the HRX217VLA boasts time-saving measures such as self-propulsion (a fast top speed to get done quicker, I might add) and a large bag. All in all, it’s designed for efficiency to get you on and off your yard as fast as possible so you can enjoy the weekend. It should last for years with the proper care! Reliable, powerful and easy to use!